Nestled in the shadow of Mount Otemanu, this luxury 5-star resort provides breathtaking splendour on the beaches of French Polynesia’s Bora Bora. Enjoy sensational shark and ray safaris, thrilling jet-ski tours, and tropical nature hikes up to the island’s verdant peaks. Experience total revitalisation at Miri Miri Spa by CLARINS, that occupies its own ethereal island in the middle of a private lagoon. Summon a private golf cart to explore the 44 acres of natural beauty this resort has to offer. Ideal for a romantic splurge and also suitable for small families, the Reefside Garden Pool Villa is an upgrade in size from the standard floor plan facing the reef. Set back amidst lush palm fronds, this suite offers direct access to an awe-inspiring vistah to the surf on the reef of the Resort’s open ocean side. Luxuriously designed in exotic noble woods and Italian marble, this suite features a larger separate lounge with a daybed nook and bedroom with an adjoining lavish bathroom that opens into a private walled-in garden equipped with an outdoor shower. A more spacious coral-pink hued stone terrace with a dining gazebo and refreshing pool completes this picture of tropical elegance. Set back amidst lush palm fronds, the Beachside Pool Villa offers direct access to powdery white sands lapped by the gentle waves of the Resort’s calm bay. Luxuriously designed in exotic noble woods and Italian marble, the Beachside Pool Villa is a suite featuring a separate lounge and bedroom with an adjoining lavish bathroom that opens into a private walled-in garden equipped with an outdoor shower. A spacious terrace with a dining gazebo and a refreshing plunge pool overlooking Bora Bora’s stunning lagoon completes this picture of tropical elegance. 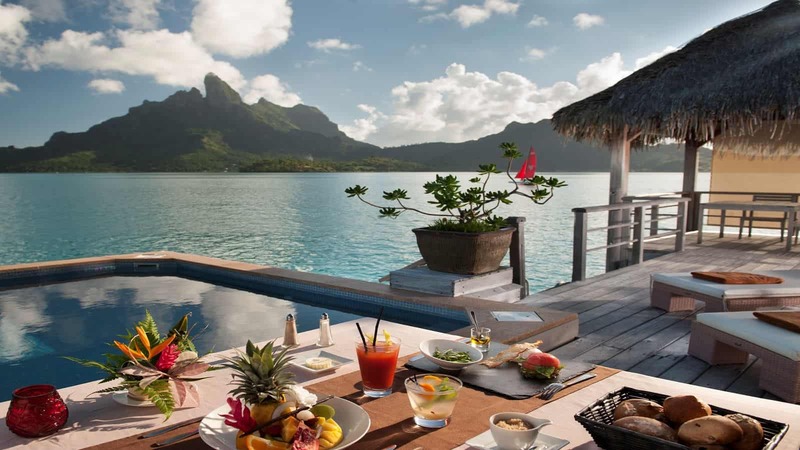 Overwater Deluxe Islandview Villas face the main island for the added indulgence of Bora Bora’s skyline view. Luxuriously designed in exotic noble woods and Italian marble, the Overwater Deluxe Islandview Villa is a suite featuring a separate lounge and bedroom with an adjoining lavish bathroom. Glass viewing panels throughout the Villa allow glimpses into the turquoise waters below. A spacious terrace with a dining gazebo overlooking Bora Bora’s stunning lagoon completes this picture of tropical elegance. Overwater Deluxe Otemanu Villas face the guaranteed views of Bora Bora’s iconic Mt Otemanu. Luxuriously designed in exotic noble woods and Italian marble, the Overwater Deluxe Otemanu Villa is a suite featuring a separate lounge and bedroom with an adjoining lavish bathroom. Glass viewing panels throughout the Villa allow glimpses into the turquoise waters below. A spacious terrace with a dining gazebo overlooking Bora Bora’s stunning lagoon completes this picture of tropical elegance. Ideal for a romantic splurge and also suitable for small families, the Overwater Premier Otemanu Villa with Whirlpool is an upgrade in size from the standard floor plan. Luxuriously designed in exotic noble woods and Italian marble, this suite features a larger separate lounge with a daybed nook and bedroom with an adjoining lavish bathroom. Glass viewing panels throughout the Villa allow glimpses into the turquoise waters below. A more spacious terrace with a dining gazebo and relaxing whirlpool overlooking breathtaking sunset facing views of Mt Otemanu completes this picture of tropical elegance. The Reefside Royal Garden 2-Bedroom Villa with Pool is a two bedroom and two bathroom suite spread out over 368 square metres (3961 square feet) which offers an awe-inspiring vistah to the surf on the reef of the Resort’s open ocean side with the islands of Taha’a and Raiatea for backdrop. Luxuriously designed in exotic noble woods and Italian marble, this suite features a central lounge between two bedrooms with adjoining lavish bathrooms that open into private walled-in gardens equipped with outdoor showers. A coral-pink hued stone terrace with two symmetrical dining gazebos and a refreshing infinity edged pool completes this picture of tropical elegance. Overwater Royal Otemanu 2-Bedroom Villa with Pool is a two bedroom and two bathrooms suite spread out over 265 square metres (2852 square feet) featuring the largest suspended pool over the lagoon in the South Pacific. Luxuriously designed in exotic noble woods and Italian marble, this suite features a central lounge between two bedrooms with adjoining lavish bathrooms. Glass viewing panels throughout the Villa allow glimpses into the turquoise waters below. A large terrace with two symmetrical dining gazebos and a refreshing pool overlooking breathtaking sunset facing views of Mt Otemanu completes this picture of tropical elegance. The ultimate St. Regis Bora Bora Resort experience awaits in the Royal Estate… This 1200 square metre (13000 square foot) private compound is closed in on three sides with coral walls and opens up to its own private beach facing Bora Bora’s sparkling lagoon. Inside, an entrance lobby, 3 bedrooms and 4 bathrooms, a dining room and lounge with adjoining professional kitchen, an office and a solarium surround a central open sky courtyard with a pool tiled in light-reflecting white glass mosaic. Sculpted columns of lustrous exotic wood line the internal walkways bordered by lush tropical vegetation. Textures blend indoors as Venetian stucco wall treatments, Italian marble, noble woods, woven fibres and rich fabrics subtly mix with fine Polynesian art accents. The separate master bedroom pavilion features a whirlpool, sauna and steamroom as well as a private gazebo. Finally, the glass wall solarium opens out onto a large airy terrace elevated above the beach and lagoon and appointed with deckchairs, beach umbrellas, tables and chairs for dining and an outdoor shower. All reservations in the Royal Estate include dedicated butler service. A private Chef is also available on request. The St. Regis Bora Bora Resort boasts 44 acres spread across three “motus” (islands), the resort is surrounded by the open ocean and a large lagoon, and offers views of Bora Bora’s iconic peak, Mount Otemanu. Choose a spectacular Villa over the water, a pool beach villa, oceanfront villa or the Royal Estate (a 13,000-square-foot distinctive private home). Enjoy the private resort spa on a secluded island in the lagoon that offers an range of traditional and classic treatments. The resort also offers a range of activities such as shark and ray safaris, thrilling jet-ski tours, and tropical nature hikes up to the island’s verdant peaks and more. The resort signature restaurant. Helmed by internationally renowned chef Jean-Georges Vongerichten, Lagoon melds French and Asian cuisine for truly exceptional results. For a more casual dining experience, offering vibrant sushi and fresh fish. Craft cocktails and light fare.